British director Christopher Nolan was Hollywood's fourth-highest earner of 2010 having made an estimated $71.5m (£44.3m), according to Vanity Fair. 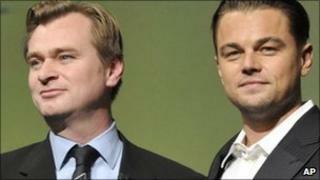 The US magazine estimates he earned $69m (£42.8m) from Inception and $2.5m (£1.6m) from older film revenues. Its annual Top 40 earners list puts Avatar director James Cameron at number one with an estimated $257m (£159.4m). British Twilight actor Robert Pattinson was ranked 15th on the list with estimated earnings of $27.5m (£17.1m). That put him below his US co-stars Kristen Stewart and Taylor Lautner, but ahead of such actors as Angelina Jolie and Jennifer Aniston. Johnny Depp was placed second on the Vanity Fair list with estimated earnings of $100m (£62m) from films including Alice in Wonderland and The Tourist, in which he starred with Jolie. Steven Spielberg, ranked second last year, dropped a place with $80m (£49.6m) - $50m (£31m) of which, Vanity Fair suggests, came from Universal theme park royalties. Actors Leonardo DiCaprio, Adam Sandler and Robert Downey Jr all made the Top 10, while Stewart was ranked as the highest-earning actress. Her estimated 2010 earnings of $28.5m (£17.7m) put her 13th on the list. Vanity Fair's list is limited to "creative figures" and does not include earnings from "non-film-related projects". Transformers director Michael Bay topped last year's rundown with estimated earnings of $125m (£77.6m).